“Someone in the Crowd” could take you where you want to go. Aspiring actress, Mia (Emma Stone), works as a barista in a coffee shop on the Warner Bros studio lot. She dreams of becoming an actress, but spends too much of her time auditioning for bad roles. Meanwhile, struggling jazz musician, Sebastian (Ryan Gosling), hopes to open his own Jazz club one day. The two fall in love and strive to chase their dreams in the city of Los Angeles. The industry have been in desperate need of a modern masterpiece this year– the supply has run dangerously low. Now we have one. La La Land is an enchanting piece of film that everyone should experience, no matter how your personal taste may differ. It’s not all sunsets, singing and cool cars. It is a tale of romance, wrapped in a homage to old Hollywood films. The opening scene makes one question whether the film is going to be a complete flop. This is soon saved by the remainder of the film, which is an innovative creation in style and substance – a real gem that will stand the test of time. Chazelle, and particularly his two leads, can only be applauded, with Mia and Sebastian’s relationship remaining so convincing. Stone and Gosling hold that rare connection and chemistry, each giving an effortlessly eloquent performance. The fact alone that Ryan Gosling learned to play the piano for the role, is all the more impressive. Watch out for JK Simmons’s entertaining cameo – odd, but evokes laughter nonetheless. Supporting characters are less rounded, but Chazelle’s focal point is the two leading stars; attention does not deviate from either of the two, and rightly so. In typical Chazelle fashion, the film’s visual style is compelling, with stunning splashes of bright colour, dazzling costume choices, and a dynamic camera that keeps you on your toes. Each shot is so cleverly crafted to enhance the significance of the details. It juxtaposes a modern day setting, but a has wonderful Old Hollywood feel, referencing “Rebel Without a Cause” in particular. The catchy soundtracks simply aid in this standout trip to the silver screen. From the intimate “City of Stars”, to the toe-tapping “Someone in the Crowd” and “Another Day of Sun”, La La Land exudes charm. 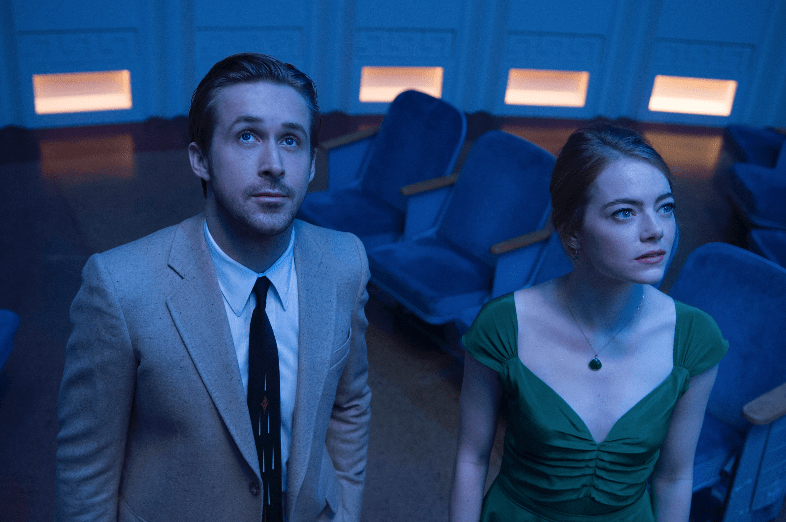 The second you exit through those swinging cinema doors, La La Land takes immediate effect. It will have you breaking into song and sliding along the floor in attempt to imitate the dance moves you just witnessed on screen. One of the years best, with compelling camerawork and flawless cinematography. Given its nostalgic heart, it might well surpass them all. Totally agree! “City of Stars” has to be the worst ear-worm of the year…. I continuously find myself tunelessly whistling it (and I’m not even on a pier). Oh, me too – I can’t get enough of “Someone in the Crowd” either! Find myself dancing as I walk…So darn catchy!! By the way, talking of “Someone in the Crowd” that’s surely Damien Chazelle standing in front of Mia at the concert…. https://i2.wp.com/bobmann447.files.wordpress.com/2017/01/lala7.jpg?ssl=1&w=450 . Isn’t it? Beautifully said! If there were a rating higher than 5 stars, I wouldn’t hesitate to give it to this film! Nothing short of a masterpiece. I thought the film was pretty well-made, but it’s not a fave type of film of mine. Not a fan of musicals, then? Thanks for sharing your thoughts! It was indeed very well-made! Oh no, I love musicals! But, this one seemed more like a jazz musical than a Broadway showtune-type musical which is more what I’m into. I can’t remember any of the songs from La La Land after seeing the film. I was torn between a 9 or 10/10 when I first watched it, but I have listened to every song at least 20 times since and I seem to be loving the film more somehow. I hope Chazelle decides to do another modern musical as he is clearly adept in this film genre, plus it is better than having remakes, reboots, sequels, prequels and every comic book character being made into a film, which seem to be the only things Hollywood make these days. Oh, I agree. The second I got back, I downloaded the soundtrack, and have been dancing my way around since. Out of the songs, which is your favourite? And definitely – finally, someone who agrees with my thoughts!! The amount of sequels, prequels and remakes is embarrassing. Thanks so much for sharing your thoughts! This one made my heart sing. Then I wept for days. “Given its nostalgic heart, it might well surpass them all”. This is indeed the heart of its brilliance. Not a masterpiece, just a superbly conceived film that celebrates Hollywood like a deity. The genre is re-born. Seeing JK Simmons dance (however brief) was worth the price of admission alone. Oh, tell me about it…hilarious!! He looked so thrilled with himself too.